Jon Johnson File Photo/Gila Herald: The Pima Town Council gave its citizens one last chance to chime in on a proposed distracted driving ordinance that will ban the use of handheld electronic devices while driving in Pima. PIMA – With change comes education. The Pima Town Council has spent the last two months attempting to educate its citizens regarding a proposed hands-free device distracted driving ordinance and giving them a chance to share their thoughts with town leaders. At the Pima Town Council’s Tuesday night meeting, Pima Town Hall was packed to near standing-room only. While most were there to speak and hear about a separate agenda item regarding parking at the Pima High School, a number of people spoke out about the proposed ordinance. 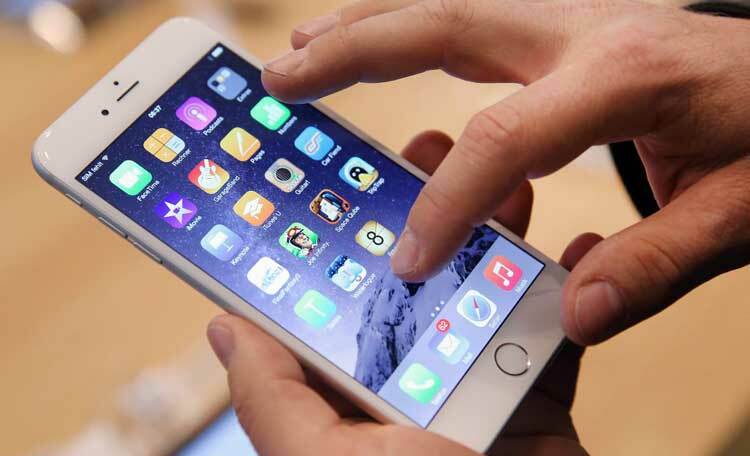 The ordinance would make it against Pima Town Code to use handheld mobile telephones or portable electronic devices while driving. The ordinance would still allow for hands-free use through integration with one’s vehicle and via speakerphone. First responders such as police, fire, and EMS are exempt from the law while performing their duties, and anyone communicating with them or a hospital would be exempt as well. A violation of the ordinance would allow officers to cite a person for a civil traffic violation with a first-time penalty of $50, followed by a $100 fine for a second violation and a $200 fine for a third and any subsequent violations. Pima Mayor C.B. Fletcher said the fines are there to serve as a deterrent and that it is not a money-making effort by the town, which actually collects very little of any money from such fines. He and Police Chief Diane Cauthen added that the new ordinance would have a learning curve and that people will be educated on it and given warnings for the first couple of months it is enacted, so people become aware of it. Additionally, signs will be posted at the west and east ends of the town limits advising those traveling through Pima to put down their phones or risk being fined. Education is key. One of the students who spoke up against the proposed ordinance, 16-year-old Haylee Gomez, was surprised to learn that Arizona already has a state law on the books regarding teens being prohibited from using s cell phone while driving. The law, which went into effect July 1, prohibits new drivers between the ages of 15 1/2 and 18 from using a cell phone while holding their learner’s permit and during the first six months of their provisional license. Teens are only allowed to use a cell phone in an emergency situation or to listen to navigation directions. If a teen driver doesn’t receive any citations for phone use, nighttime driving, or additional passengers for six months, the law no longer applies to them. Arizona is only one of two states that don’t have a statewide ban on the use of cell phones while driving. According to data from the National Highway Traffic Safety Administration, 3,450 deaths nationally were due to distracted driving in 2016. The average time a person spends looking at their cell phone screen to either text, email, make a call, or some other use is five seconds at a time. Traveling at just 35 mph, that means a driver is blind from the road for 250 feet – just 50 feet shy of the length of a football field. Pima could be the first municipality in Graham County to adopt a distracted driving ordinance (mostly directed at the use of cell phones). Safford – which initiated the plan in Graham County – and Thatcher appear to be waiting for a statewide regulation along with Graham County, according to Pima Town Manager Sean Lewis. The ordinance is, word-for-word, exactly the same as the one presented to the Safford City Council at its Sept. 10 meeting by Safford Police Chief Joe Brugman. 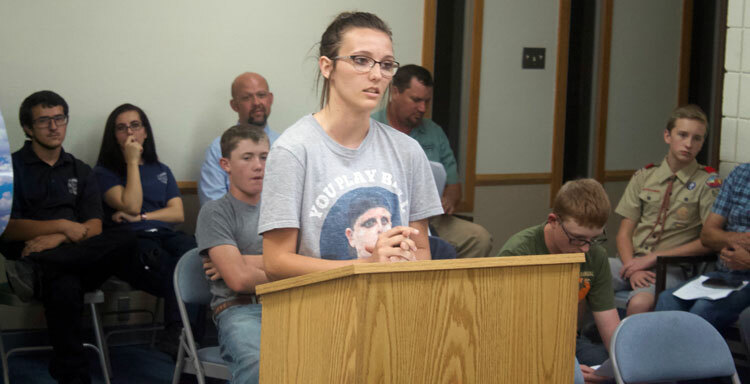 Jon Johnson File Photo/Gila Herald: Pima High School Student Body President McKayla Bartlett previously addresses the Pima Town Council at its October meeting. Bartlett agreed that passing an ordinance banning the use of handheld cell phones while driving would be beneficial to public safety, especially for teenage drivers. Lewis said while he believes a state law is inevitable, he doesn’t want to wait for the state to act and doesn’t mind getting his hands dirty and taking the lead on this action in Graham County if it means making the streets safer for drivers and pedestrians. Pima Student Body President McKayla Bartlett said she was for the law and that she already doesn’t use her cell phone to text while driving due to a different deterrent. “If I get pulled over for texting and driving my parents would kill me,” Bartlett said. Lewis said a punishment is better than the alternative of what could happen to someone using a cell phone while driving and that whatever text or message comes through is not important enough to endanger lives. The Pima Town Council will likely vote on the ordinance during its next meeting in December and it will likely pass.